Formulated with an exclusive Crystalline Complex, Brilliant Brunette® Liquid Shine Illuminating Shampoo penetrates damaged areas within the hair while it polishes the exterior of each strand to optimise the reflection of light and create a crystal clear shine. The best thing about finding a good beauty product is that you can share your findings with everyone else! I’ll be honest, I didn’t really know about John Frieda before, I didn’t even know the brand existed, until Rubybox sent out some samples (of course I didn’t receive it), but it influenced me to purchase it since everyone else was raving about how amazing the product actually is. I tend to dye my hair a lot and my last hair dye colour was a rich Iced Coffee shade, which then leaves me with a brunette shade. I love having shimmering hair (that beautiful look you get just after colouring your hair), however the shimmering effect doesn’t last very long. As soon as I noticed the John Frieda Brilliant Brunette Liquid Shine – Illuminating Shampoo , I knew that it was going home with me tonight. The shampoo is meant for all shades of natural, colour-treated or highlighted brunette hair. Everything about this shampoo just screams luxurious, classy and salon-quality at an affordable price. The shampoo comes in an eye-catching squeeze tube, which is a shimmering silver with a gorgeous mirror finish (you’ll catch yourself quite a few times just staring at the tube, I promise). The tube comes with a clear, sturdy lid, which is very strong because I’ve dropped mine accidentally quite a few times! Plus, the tube has a beautiful eye-catching design at the top of the tube and also has a gorgeous dark brown writing, which stands out on the tube. I find the presentation of the tube to be equally as important as the product because it should look classy if its giving you a classy look, which is exactly what this amazing shampoo does. 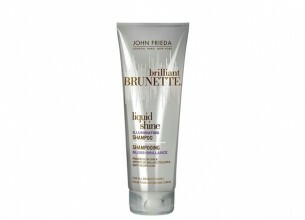 About the John Frieda Brilliant Brunette Liquid Shine – Illuminating Shampoo: “Formulated with an exclusive Shine-Enhancing Complex, Brilliant Brunette Liquid Shine Illuminating Shampoo penetrates damaged areas within the hair while it polishes the exterior of each strand to optimize the reflection of light and create a crystalline shine.” (John Frieda Website). Once you’ve opened your tube of John Frieda Brilliant Brunette Liquid Shine – Illuminating Shampoo, you’ll get the lovely scent of the shampoo, it has an absolutely dreamy fragrance, you won’t be able to wait to wash your hair and have your hair smell as amazing as the shampoo. The shampoo is clear and gives no colour deposit to hair, but the magic it performs to your hair is really out of this world! The John Frieda Brilliant Brunette Liquid Shine – Illuminating Shampoo is quite thin in texture, so you don’t really need a lot of shampoo to work in your hair, because the shampoo also lathers very nicely to a rich and dreamy scented foam. After you’ve washed your hair, you will definitely feel like you’ve walked out of a salon, it’s exactly how I feel every time I use the John Frieda Brilliant Brunette Liquid Shine – Illuminating Shampoo.I’m crazy about my hair and I always make sure I have good products which will take care of my hair and all the needs my hair has. I was excited to see the results from the John Frieda Brilliant Brunette Liquid Shine – Illuminating Shampoo. However, to see the results I wanted to see, I’ve been using the product for just over three weeks now. I noted down the results to share my experience about how absolutely amazing this shampoo actually is. The only thing I was worried about is that I have quite oily hair and I wash my hair every two days, so I was hoping that with the John Frieda Brilliant Brunette Liquid Shine – Illuminating Shampoo I wouldn’t have to wash my hair everyday! First Wash: My hair smelled amazing, my hair was squeaky clean with two washes and there was no oil build up at all. My hair also felt much silkier than usual, my hair detangled much easier than normal and my hair didn’t look so dry like it normally does. Once I dried my hair, you could actually see the shine and my hair had an amazing scent from the shampoo all day long. I did not flat iron my hair after the first wash.
Second Wash: After seeing the results from the first wash, I was much more excited to try out the John Frieda Brilliant Brunette Liquid Shine – Illuminating Shampoo again! After my second wash, my hair had all of the results from the first, plus my hair had a lovely glossy finish. After drying my hair, I straightened my hair using a Glampalm Hair Straightener and I found my hair to look absolutely radiant, glossy and shiny. My hair also had achieved a shimmering look in the light. My hair really looked like I had used a lot of hair serum or hair silicone to achieve the look. After One Week: I noticed an improvement in my hair, my hair looked more healthy, I had less fly aways and I had more straight-looking hair without any straightener needed. My hair didn’t need much detangling and I have fine hair, which tangles a lot. In my first week I noticed that the John Frieda Brilliant Brunette Liquid Shine – Illuminating Shampoo doesn’t make your hair oilier if you do have oily hair, but it also doesn’t help keep hair looking fresh for more than a day, which is what I get from regular shampoos. In my first week I had noticed in the sunlight my hair looked amazing, I couldn’t believe it was my hair. After Two Weeks: My hair looked the same as before, however I noticed after styling my hair, it looked much more glossy and salon done, rather than home-styled. I had curled my hair in the second week, normally I’d use a shine spray on my hair to make my hair look amazing without looking dull, however in the second week there was no need for shine spray, hair silicone or any other type of product you may think you need for radiant hair! After Three Weeks: I was convinced that I will NEVER change my shampoo, when I look at the results, they are just simply amazing. I wish I had discovered the John Frieda Brilliant Brunette Liquid Shine – Illuminating Shampoo earlier so I could have had my hair look this silky and smooth with a beautiful glossy look. My hair caught the light all the time and my hair looked simply amazing in the natural light, sunlight and in photographs with flash. After seeing the results I have in three weeks, I will be sticking to the amazing John Frieda Brilliant Brunette Liquid Shine Range. This is the first shampoo which gives hair such amazing results after the first use. Pro’s and Con’s of the John Frieda Brilliant Brunette Liquid Shine – Illuminating Shampoo. The packaging is cute, trendy and very classic, definitely worth the price. The product has a good texture, which means you can use less but still have clean hair. The product lathers very well, so there’s no wasting. The product comes in a squeeze tube, so it’s easy to get every drop out of the package. The product makes hair look radiant, glossy and feel silky smooth. The product helps hair which tangles easily. I couldn’t really find anything wrong with the product. I would say the only thing is if your hair is oily, you might not be too happy that it doesn’t really help the oily situation. The Price: It can be debated, but I really wouldn’t say the price of the product is actually a Con, because you’re getting a salon quality product for R99, which gives your hair a complete shine and smooth texture boost, it’s really worth the price you paying. A “just left the salon” look in a bottle. I would recommend this product to everyone who wants to achieve a glossy, mirror effect hair, which looks healthy and radiant. Especially after seeing the results I have seen, I would really recommend this product. Plus the product is really long-lasting, even if you’re washing your hair three times a week, the shampoo comes in a 250ml tube, so there is more than enough shampoo to make your hair look amazing in a matter of few days. Plus, if you dye your hair often, it makes the hair colour look more radiant and has that “just coloured” look, which brings out the true colour of your hair. So what are you waiting for? Go out and get your amazing hair, which is waiting at a Clicks store near you! I have been using this shampoo together with the conditioner for the last month now & I am so impressed. While I have used other John Frieda products in the past, I have never been a particularly loyal customer. That is, until I tried this… It is now the only shampoo I will use as it hydrates my hair without weighing it down, adds the most amazing shine & it smells heavenly. If you’ve got medium to dark brunette hair, I highly recommend this shampoo!